Nestled in the cozy town of Middleboro, MA, Nightingale Doggie Lodge is situated on 5 acres of land. Our facility is over 2,400 square feet, and has plenty of room for your dog to enjoy. Our indoor pens are 4 x 6 feet and come equipped with comfortable dog beds. Further, to provide the most comfort for your dog, our indoor pens are heated and air conditioned. Our outdoor pens are 10 x 40 feet, providing your dog with more than enough room to run around and get plenty of exercise! Best of all, our outdoor pens provide your dog with the opportunity to socialize with other dogs and make new friends! Both the indoor and outdoor pens are equipped with fresh water at all times. In short, our facility is modern, clean, and spacious! Clients are welcome to bring blankets, toys, and/or treats for your dog to enjoy while staying at our facility. Our facility is your premier choice for boarding your beloved dog. 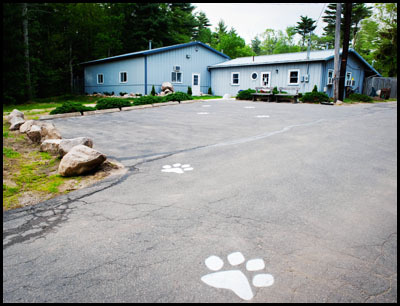 Simply follow the paw prints leading up the driveway and stop in today!